How to handle errors when calling WebReport.DesignerSaveCallBack - Fast Reports Inc.
Online Designer is an excellent tool for creating reports on the Internet. Let's look at the situation. You create a report template, save it, and ... See the message "was not saved". But what is wrong? How do you know what the error is? Now, the web report has the Debug property, with which you can "catch" errors right in the online report designer. We need to enable the WebReport.Debug property and create an error handler in the method of saving the report. 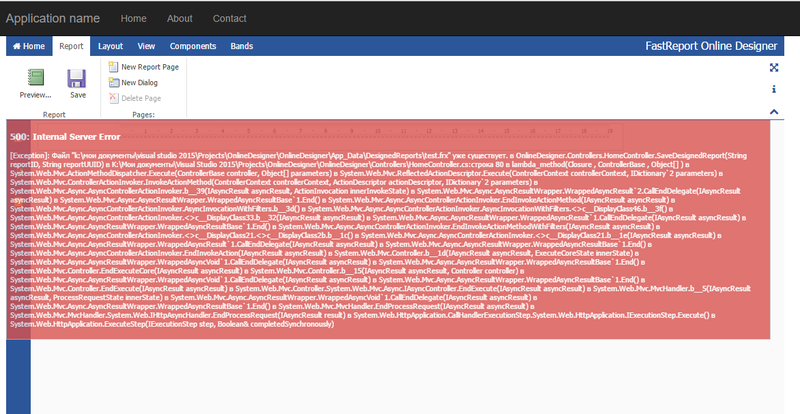 The error will be passed to the designer when the WebReport.DesignerSaveCallBack event is called. 5. The handler sends an error to the online designer. Let's look at an example. Create an ASP.Net MVC application. At the top we display the title of the page. Next, we display the report received from the controller. Go to the "Report" tab. Click "Save". The first time should be successful. Press the save button again. And we get an error. From the text it is clear that the report template file with this name already exists. So we got a debugging tool for our reports and the web application as a whole.